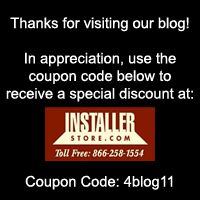 ← Installerstore.com – New Online Offer! Old Man Winter To Visit Wisconsin! We are expecting our first blizzard Thursday. Customers please make sure to check your tracking numbers, because weather may delay the delivery of your package. We may have limited staff tomorrow due to road conditions, so if you get our voicemail during business hours, please leave a message and a sales staff member will get back to you that day or Friday. Everyone in the storms path, please be safe!